The development of toddlers fascinates me. You would think I should know what they can achieve having worked in education for over 15 years, but no, the girls amaze me daily. Every day is a new learning day where I see new little sparkles of achievement glittering! Constant problem solving, trying to reach their next goal, setting targets, all of which they are completely unaware of, of course! 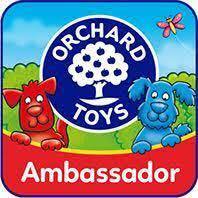 I was recently asked to be an Ambassador for Orchard Toys. I have only ever heard buzzing reports and excellent words about this company so felt completely honored to have been asked. The girls are at a perfect age to take on this challenge as their games are aimed at children as young as 18 months old. Our first game we have been given to trial was called ‘Animal Shapes’. 12 double sided brightly coloured individual 2 piece puzzles in 1 box. Each puzzle is in the shape of an animal with a shape that pops out from the middle of each. When I walked into the room with the brightly coloured box, the girls were instantly captured and wanted to know what I had! 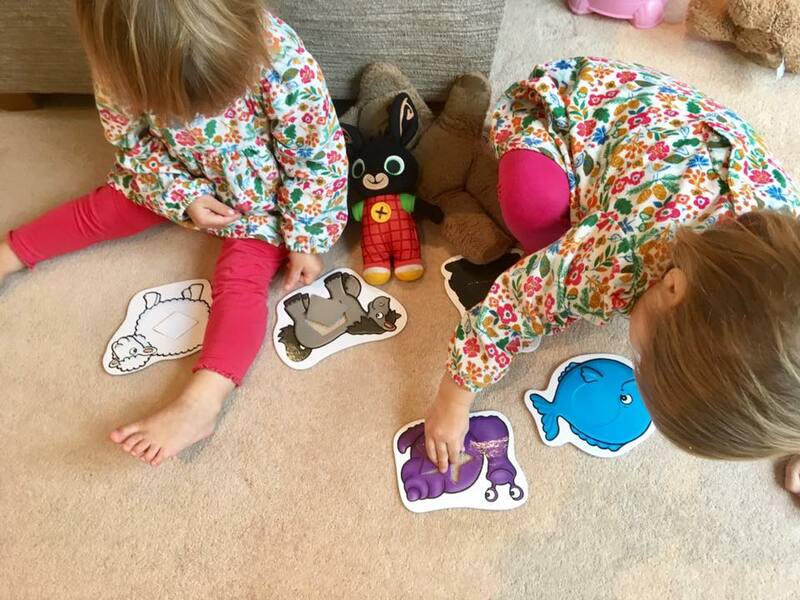 Just a few months ago the girls weren’t at all interested in games or puzzles other than the odd peg puzzle, but when I introduced the ‘Animal Shapes’ game to them, they were intrigued. It was the first time I had noticed them actually showing an interest in a game, but not only this, after just a short time, they had the determination to finish all 12 puzzles. Sometimes they played with the game on their own, and sometimes together. They will even work together to test each other! One will hold an animal up, and the other has to find the correct shape – great team work and evidence of turn taking. Initially I just allowed them to explore the game, placing the pieces on the floor and spreading the shapes out. The girls loved the fact that they could instantly connect with it as they adore animals and straight away, they started saying the names of the ones they knew. In the right hand picture, Poppy is saying ‘dog’. I popped out the middle shapes for the first time giving them just 3 each to explore. Why did I do this? I did it to keep it simple. Having 12 puzzles all at ones the first few times can be over whelming and put children off so I wanted to keep it fun. This game has several educational aspects; Shape matching and identification, Colour matching and naming and exploring animals. After a few days, once they understood that the idea of the game was to match up the shapes and colours with the holes, I started to introduce key vocabulary to extend their learning. We focused on three main areas; shapes, colours and animals. To start with, we tackled each one individually so that we didn’t confuse them until they started to get confident to combine them together. This didn’t take long. After only a week or so, they could sit and complete the whole set on their own but I still like to play with them on occasions to work on the shape and colour aspect side to the game. The girls enjoyed the reward of being able to complete a game themselves, and I think the benefits here are that adults can interact and extend the children’s learning in a fun way. A way in which children relate to easily. The twins will happily play with the ‘Animal Shapes’ game for a good 20 minutes if playing independently, and longer if I interact with them. The game says it is suitable for 18 months + which I do agree with. The twins were born prematurely and I feel that this has had a little impact on their development so are taking to things slightly later. All children develop at different rates so always bear this in mind. 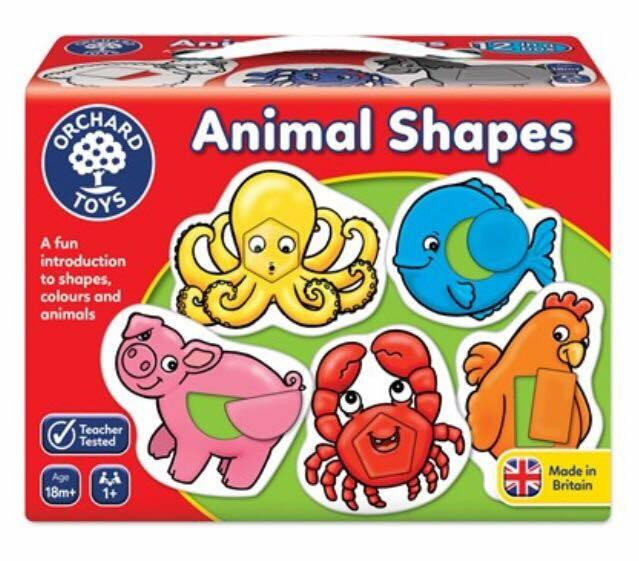 Animal shapes by Orchard Toys gets the thumbs up from us! It is the first game we have played with by this company and I will definitely be buying more games in the near future. The game is small and compact to store and very reasonably priced at just £7.50. They also make perfect gifts! Click here to buy your own ‘Animal Shapes or please just go an have a browse. I can assure you, you will be impressed – They have games for all ages! **The game was gifted to us for the purpose of this blog but all thoughts and opinions are Popitha’s.